"A wonderful, tasty summer stew. My mom always made this for us in the summer - I loved it then and I love it now! Serve topped with freshly grated Parmesan or Romano cheese." Heat the olive oil in a large pot over medium heat. 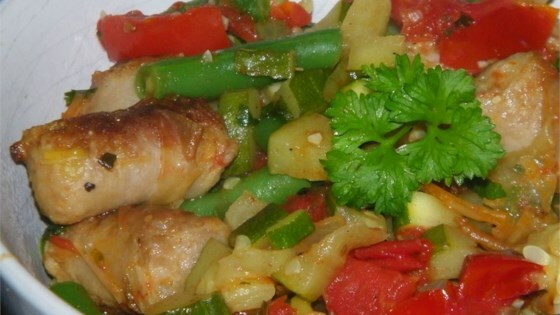 Mix in the sausages, onion, potato, green bell pepper, and garlic. Cook 10 minutes, stirring often, until potatoes are slightly tender. Mix the zucchini into pot. Pour in the tomatoes and their liquid and 3/4 tomato can (21 fluid ounces) water. Season with basil, oregano, parsley, salt, and pepper. Bring to a boil, reduce to low, and simmer 40 minutes. Stir the green beans into the pot, and continue cooking 5 minutes, until beans are heated through. Great recipe I added a little cayanne and some crushed red pepper ,just to give it a little kick. We really enjoyed this recipe. Great use of the garden veggies. May freeze some and save it for winter. Used Hot Italian Sausage for a little kick. Also made in crockpot. I added a little bit of taco seasoning and a handful of tortellini, and it made it even tastier! It is rare my entire family LOVES something. Well this was it!